This image released March 8, 2012, shows the biggest group of odd magnetic anomalies on the moon near the northern rim of the largest lunar crater. The anomalies (left) stem from highly magnetic material likely from an asteroid that created the 2,000-kilometer-wide basin, scientists say. A giant asteroid collision with the moon that created the solar system's largest known impact crater may have spawned the surprisingly strong magnetic anomalies seen on the moon, a new study suggests. The Apollo missions to the moon revealed that portions of the lunar crust are strongly magnetized. The origin of these magnetic anomalies has proven enigmatic, with potential explanations including a much stronger, longer-lasting magnetic field on the moon than before predicted. Most lunar magnetic anomalies had not been linked with any known geologic structures, which is part of what made it difficult to determine what might have created them. "We've had no good explanation since the Apollo missions for why some regions were magnetized while others weren't," said study lead author Mark Wieczorek, a planetary geophysicist at the Institute of Earth Physics of Paris. This crater had previously received little consideration regarding the mystery of lunar magnetism because the first global maps of lunar magnetic fields that included this basin only appeared in the last five to 10 years. 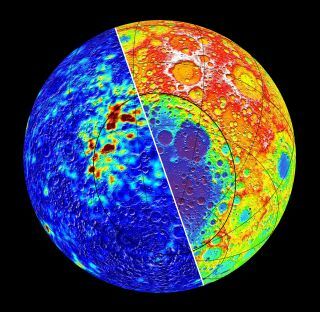 Scientists found the most prominent grouping of lunar magnetic anomalies coincides with the northern rim of this basin. They speculate these anomalies are linked with matter ejected from the asteroid collision that created the basin, with the impact coming from the south. Asteroids are typically rich in metallic iron and other magnetic minerals, making them on average hundreds of times more magnetic than most lunar crust material. The research team's computer simulations of lunar impacts suggest an asteroid about 125 miles wide (200 km) that smashed into the moon at a speed of about 33,550 mph (54,000 kph) could have created a crater approximately the size of the South Pole-Aitken basin, laying down magnetic materials up to a few miles thick. These could have been magnetized by the magnetic field once thought to permeate the moon for several hundred million years, creating magnetic anomalies similar to what are seen today. These findings could shed light on other magnetic anomalies seen in the solar system, such as those in the southern highlands of Mars. "Mars is somewhat similar to the moon in that it had a core dynamo — a magnetic field generated in its core — that turned off in the past, but it still has these very, very strong magnetic anomalies," Wieczorek told SPACE.com. "People have had a hard time trying to figure out what minerals might cause these anomalies and why they are concentrated in certain areas on Mars." "Recent work suggests that the northern lowlands of Mars were created by a giant impact early in the evolution of our solar system," Wieczorek added. "This would lead remnants of the impact to be found in the southern highlands, perhaps explaining the magnetic anomalies seen there." A better understanding of lunar magnetism could help out future lunar colonists. "Magnetic anomalies could help stop charged ions from solar winds, and it may be of benefit to build colonies on magnetic anomalies to stay safer there," Wieczorek said. The scientists detailed their findings in the March 9 issue of the journal Science.